Growing up in a farming family, I have many memories of helping my Dad to fetch the cows for milking when I was very young and small. Sometimes I would go alone and sing to the herd, climbing up onto the cold bars of their enclosure so that I could look into their eyes. I loved being with them and I suppose I thought my singing would please them (how very tolerant they must have been). A few weeks ago we were lucky to be among the dairy cows grazing freely in Wildcat Canyon. Many had very young calves close by, and though we knew to be quiet and careful, there were more than a few heart-stopping moments when painters and cows wondered what would happen next. After half an hour or so, we all began to relax and as the morning wore on, we painters just became part of the landscape for the cows, as they grazed around us. Cows make wonderful subjects to sketch and paint outdoors because they are so slow-moving, so gentle and yet so huge. Their range of movements is fairly small, and their body shapes follow similar patterns, though each has a distinct personality and character. The herd in Wildcat Canyon is a mixture of Candiennes (all black), Milking Shorthorns (russet brown), Brown Swiss (creamy grey), and Holstein-Fresians (black and white) and I wanted to create a strong visual connection between them. Back at the studio later on, I began to experiment with Winsor Red watercolor and black sumi ink allowing them to mix while wet. Some sketches were made on brown paper bags like the one below. Larry Hatfield forwarded the latest newsletter The Leftovers V4 2012 of the El Sobrante Historical Society which has fascinating details of the Skow Family Dairy and their herds who provided milk for Richmond and the surrounding area from 1899 to 1955. In 1924, there was a terrible ‘hoof and mouth’ disease outbreak when many east bay herds were lost, and anyone who broke the quarantine was arrested. There is also some interesting history of Wildcat Canyon here, and a downloadable document about California grasslands here describing the range of different grasslands of California, and the benefits to the local coastal grasslands of grazing cattle, which is helping to keep the encroachment of coyote brush at bay. I have started to make larger pieces like the one below of a milking shorthorn that I have seen there several times. Her left horn is damaged but she is still a magnificent and strong cow. Again, I worked very quickly and allowed watercolor and ink to mix. 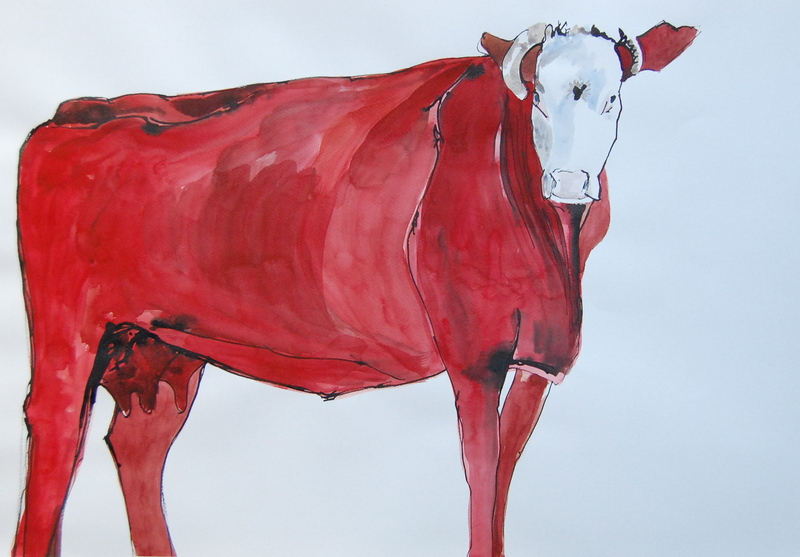 I’m working my way through a group of ten of these Winsor Red cows and will post the whole herd when they are complete. This entry was posted in Art Journal and tagged Art journal, California, Cows, east bay history, oil sketch, watercolor. Bookmark the permalink. 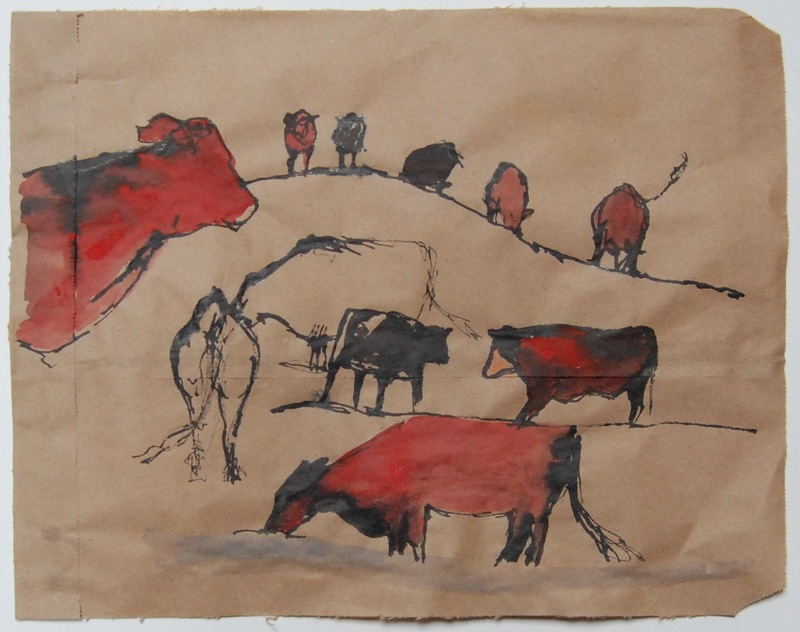 I love your cow sketches, especially on the brown paper bag background. Beautiful. Many, many thanks, we had such a great time that day. Terrific Stuff. Looking forward to seeing the whole herd, but I hope I don’t meet those red cows on a dark night. Glowing red cows on a dark night – what a good idea! I enjoyed seeing your cow works as well as your write up on your childhood memories of singing to the cows. Many thanks, I’m sure it was very quiet and out of tune, even though in my head I sounded like an angel. Ha ha. Those were the days. What lovely sketches. I sing to my cows too, though I’m not sure what they make of it! Many thanks and great to know that you’re farming in Cornwall, which I know a little. Absolutely loved your beautiful blog and from the US perspective it is very important that work like yours reaches a wider population. We are approaching a watershed vote concerning food in November, along with the election of the president. If Prop 37 is passed in California, it will make it mandatory for all GMO ingredients to be labelled and of course big ag has pushed tons of money into the against campaign. If Californi votes yes then the rest of the states will probably follow, or at least it won’t be worth developing 2 labels. Excuse the rant but there is a massive surge of people power going on and I know it isn’t winning the war but will be a very significant start. Oh good luck with that. Feel free to rant. I’d be interested to hear how it goes. I get very depressed hearing about agriculture in general – I recently heard a story about how some ‘miracle’ herbicides aren’t working any more as ‘superweeds’ have developed to sidestep them. You just shouldn’t have gone down that road in the first place I say. You might be interested in a link to a video that my sister put on my blog – in the ‘Bull’ post – about small farms. I will check out the video and keep you posted on the success of Prop 37. Happy blogging too.